With this year’s Omen laptops, it feels like HP have proved they have just as much to offer as a dedicated brand like MSI or ASUS might. Now they just need to hone in on why they offer more. HP’s latest olive branch to the gamers, their crimson-tinted Omen sub-brand, no longer feels the new kid on the block. Now, it’s just one of many, obvious-but-compelling, mainstream options for those looking to buy a good value, high performance gaming laptop. And with this year’s iteration, that pitch doesn’t really change. Whether or not that’s a bad thing, kinda depends on what you’re looking for. As per their recent refreshes of their Spectre and Envy products, the new HP Omen 15 is - at its core - a cold, calculated, by-the-numbers iteration on last year’s model. It’s better - but in a pretty purely mathematical sense. And that’s not a bad thing. The new Intel 8th-gen Core processors and Nvidia’s Max-Q graphics configuration found in this year’s HP Omen 15 do see significant improvements in both performance and form-factor. Still, it’d be nice if there were a few more surprises on the docket. This is a gaming laptop that’s clearly superior to last year’s effort - but that’s pretty much all there is to say about it. Again, though meaner and leaner, this year’s HP Omen 15 doesn’t really buck the trend nor break away from the blueprint of last year’s model. Sure, the bezels are thinner. And the new HP Omen 15 does utilises Nvidia’s Max Q graphics configuration to some effect. Directly held against its predecessor, it boasts better thermal-dynamics and a smaller physical footprint. However, compared to the rest of the Max-Q crowd, it does still come off a little bulky and heavy. The whole thing is a little more restrained relative to the other neon-lit-death-machines competing for attention in the space. Still, both under and outside the hood, the Omen 15 feels drearily iterative. It’s better, but this superiority doesn’t feel borne of particular ambition. It's just by-the-numbers. 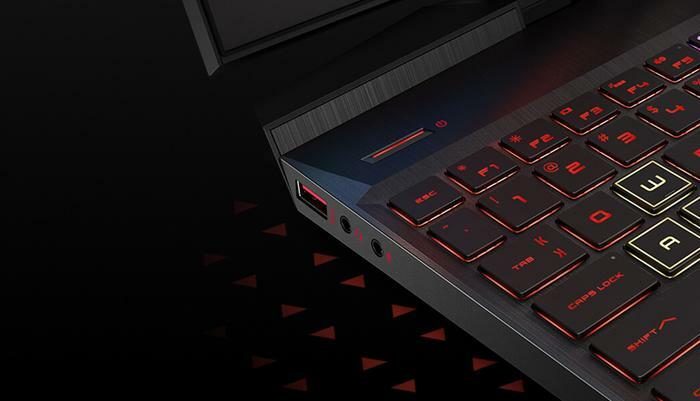 And it’s telling that even the pain-points in this year’s HP Omen 15 feel a little recycled. The trackpad is iffy in its responsiveness and the mushy keyboard isn’t much better. The HP Omen comes with 26-key rollover and lighting customizability, but it’s subject to a bunch of limitations that most of its competition has transcended in recent years. Sure - if you’re not an RGB lighting person, that’s obviously not going to be as much of a big deal. All the same, it’s probably better to have a gaming laptop with those capabilities than one without them. Compared to the current crop of gaming laptops, the HP Omen delivered respectable results but didn’t exactly blow away the competition. 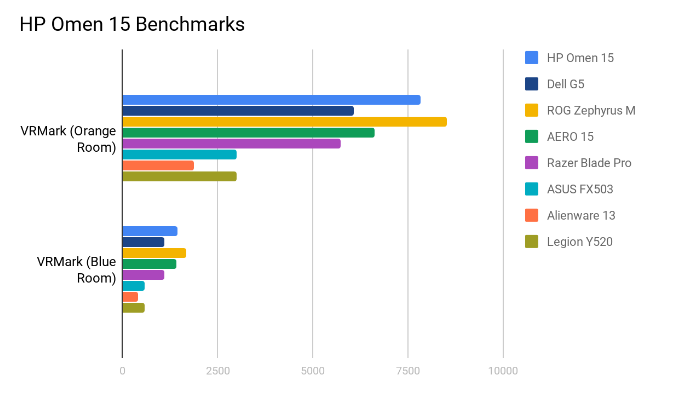 This trend continued into graphics-dedicated benchmarks like TimeSpy and FireStrike. Here, the HP Omen 15 maintained a more dominant position on the totem pole. It managed to outpace plenty - but not all - of the competition. More expensive fare like the Zephyrus M and AERO 15 gave it a run for its money but direct competitors like the Legion Y520 and Dell G5 proved poor substitutes. Finally, when it came to rating the VR-readiness of the HP Omen 15, the notebook emerged a compelling candidate. Especially given its price-point. 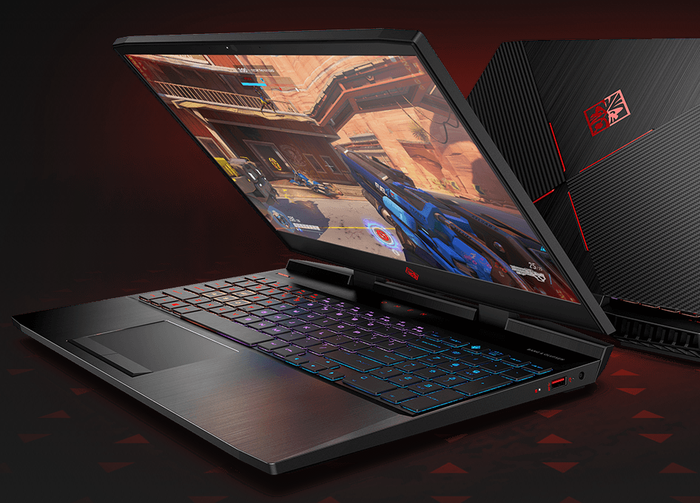 Looking beyond these raw numbers that the HP Omen 15 was so clearly designed to advance, the notebook also (predictably) excelled when it came to gaming experiences. What’s more, even during these heavy workloads, it stayed surprisingly quiet - though it did inevitably experience some fierce heat build-up. The HP Omen 15 managed Kingdom Come: Deliverance on its experimental ultra-high settings without too much fuss. Most of the time, the game floated around an average of 55-60 frames-per-second. However, during more intensive sequences - such as riding across the countryside - the game did drag downwards to around 40 frames-per-second as the fans inside the Omen 15 made their presence known. Our other usual suspect for benchmarking, Total War: Warhammer II, proved a great sampler for the capabilities of the HP Omen 15. With everything set to max, the Omen 15 delivered an average of 54.3 FPS on the game’s ‘Battle’ benchmark, 60.2 FPS on the ‘Map’ benchmark and 55.2 FPS on the ‘Skaven’ benchmark. Finally, the HP Omen 15 is the first gaming PC we’ve been able to test out the recently-released PC port of Capcom’s Monster Hunter: World on - and we came away impressed with how poorly it ran on the highest graphical settings. I mean, don’t get me wrong. Toggling the settings down to medium or high here will give you a perfectly playable experience. But with everything set to max, the HP Omen 15 could only manage between 20 and 13 frames-per-second, depending on the intensity of the scene. Obviously, that’s not ideal. But it is honestly a little refreshing to find a game that can really make a modern top-of-the-line gaming work for it. As for battery life, the HP Omen 15 performed better than the worst-offending gaming laptops out there but far short of the most long-lasting. When subjected to the Battery Eater testing tool, the Omen 15 took 1 hour and 48 minutes to dissipate its entire charge. This test is designed to burn the battery down as fast as possible and show off the minimum amount of battery life you can expect. More anecdotally, we found it fell afoul of the usual pitfalls faced by gaming laptops. Used sparsely and infrequently, it can last longer. Still, when used for its core use - gaming - the battery life deteriorates faster than you’d like. Like most modern gaming laptops, my gut says that the HP Omen 15’s appeal is largely going to come down to whether you like the look of it and whether you’ve got the money to spend on. 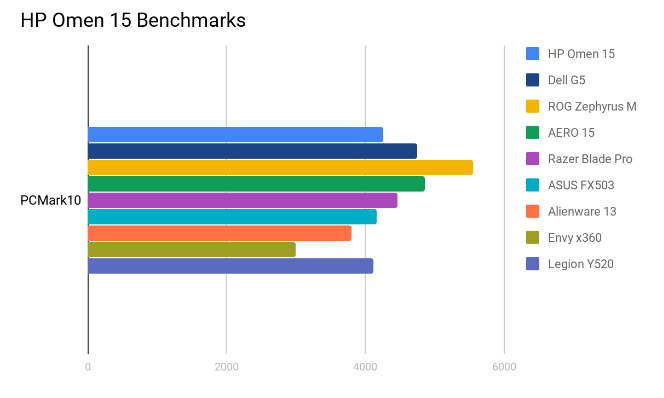 The performance it offers is great - but it’s not radically different or better than what you’d get out of the competition playing in that same price-range. 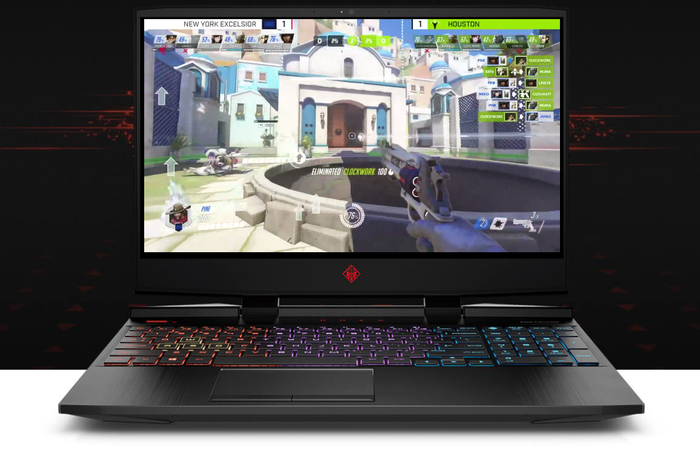 With this year’s Omen laptops, it feels like HP have proved they have just as much to offer as a dedicated brand like MSI or ASUS might but failed to really hone in on an argument for why they offer more than that.